Loncala, Incorporated owns and manages approximately 50,000 acres of timber and agriculture land between Ocala, Florida and south Georgia and in Red River County, Texas. “Loncala”, a Florida corporation, was chartered in April 1920 and began as an investment in limestone and phosphate rock reserves. After 85 years Loncala ceased the phosphate operations in February 2006. The name Loncala was created from London and Ocala. London being where the original owner was from and Ocala being the first office during the limestone and phosphate phase of the corporation. 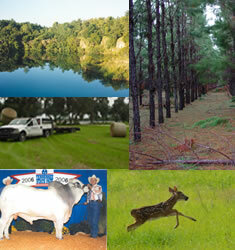 Today most of Loncala’s land holdings are used for forestry, cattle, and farming. The company also manages work crews involved in timber harvesting, timber site preparation, and tree planting. Loncala’s reputation for longevity, professionalism and integrity is found in all operations. All operations are managed from our headquarters in High Springs, Florida.